Shelley Bean: Playing Catch Up! Happy Tuesday! Happy for me because I am home from work today and taking some time to show you some projects I have worked on lately and want to share. Keep an eye out over the next few days as I work on playing catch up! Today I thought I would share a page I made a few weeks back for a challenge I was in. This is a layout I did of my son Trey when he was a toddler. Now he is 16! My, how time does fly! It's a simple page really. But, I thought I would share. 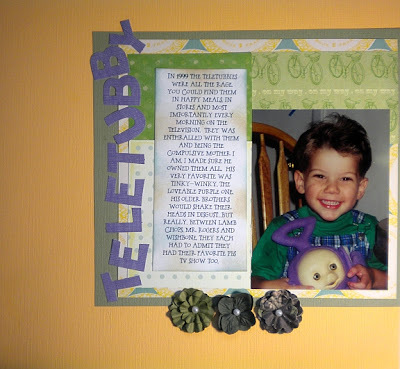 I still admit to not being a very good scrapbooker...but I keep trying. I think I lack patience with my pages and make them either too simplistic or too over the top. I can't seem to find that balance required that makes for a great page. Oh well. Someday many years from now someone may look at them and at least admit, "she gave it an effort!" :) One thing I wanted to mention that hasn't occurred in a long time....I am posting this after the challenge was over. You know what that means? That means for once I am just sharing a project without promoting any store and no product endorsement. I want to try and do more of those posts. It was a realization the other day that readers really don't get to know anything about "me" other than a product endorser unless I share. So, here I am sharin'! I love the sharing, just because. I also personally like the simple pages. It lets you get to more photos and in the end that's what matters... right? I know, not a very "scrapbook-y" answer. Looks great.